Alan Branch studied music at Goldsmiths College whilst supporting himself as an engineer at Topic Records and at the Works Studio. He joined Roundhouse Studio, where his skills as an engineer and programmer coupled with his hard working and easy-going personality led to a growing demand for his services. He soon became the chief engineer responsible for many large studio projects including being part of the famed On-U Sound crew. 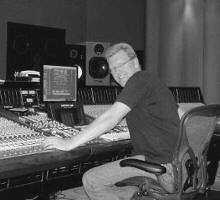 Eventually going freelance in 1995, Alan has worked all around the world but remains one of London's most in-demand producer/mixer engineers. Along the road, his co-production and remix work with dub and reggae legend Adrian Sherwood has spawned many mad and wonderful releases including albums from Sin�ad O'Connor and tracks on Primal Scream's "Xtrmntr" album - and let's not forget, of course, the 'Scream's highly acclaimed "Echodek" album. Some of the artists range from Sin�ad O'Connor, Primal Scream, Bjork, Nine Inch Nails, Depeche Mode to Ronan Keating, Blur, Sade, Boy George, Haddaway, Soul II Soul and more recently sounds for the current U2 tour. From reggae, pop, rock, folk, even classical latin, including production of Live surround sound DVD's, films, adverts and sound design - there has not been many types of projects that Alan hasn't had a hand in, showing his love for creative media and bringing an innovative combination of classic skills and experience with the latest cutting edge technology. In his spare time Alan writes for Future Music, Computer Music, Audio Media and Making Music magazines.